An implement of Operative Masonry, The trowel was adopted by Speculative Freemasons as the peculiar working-tool of the Master’s Degree. By this implement, along with its use in Operative Masonry to spread the cement which binds all of the parts of the building into one common mass, we are taught to spread the cement of affection and kindness, which unites every one of the members of the Masonic family, wheresoever dispersed over the globe, into one companionship of Brotherly Love and an old custom inside an Oxford Lodge, England, gave it prominence to become a jewel, and as a sign it goes back to the practice of the Ancient. Today this implement is known to be the appropriate working-tool of the Master Mason, because, in Operative Masonry, while the Apprentice is engaged in preparing the rude materials, which require only the Gage and Gavel to give them their proper shape. the Fellow Craft places them in the proper position utilizing the Plumb, Level, and Square; but the Master Mason alone, having examined their correctness and proved them true and trusty, secures them permanently in their place by spreading, with the trowel, the cement that irrevocably binds them together. The Trowel has also been adopted as the jewel of the Select Master. But its uses in this Degree are certainly not symbolical. They are simply linked with the historical legend of the Degree. The Masonic Trowel as well as the Masonic Plumb are foiund on most Masonic Rings. 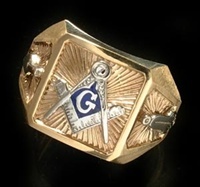 This entry was posted on Monday, March 19th, 2012 at 5:20 pm	and is filed under Freemasonry. You can follow any responses to this entry through the RSS 2.0 feed. You can leave a response, or trackback from your own site.